We have a wide range of campervans and motorhomes with more useful features. Our campers are available for hire from a great location close to Brisbane Airport. Five star campervans are nifty, compact, fun and fuel efficient. Whether you’re looking something different on your family holiday, or are traveling solo, a campervan is the best way to see the sights of Australia! We offer a convenient service which enables you to compare rates and vehicles from the inclusive range of campervan and motorhomes in Brisbane to help you find the best deal that meets your needs. 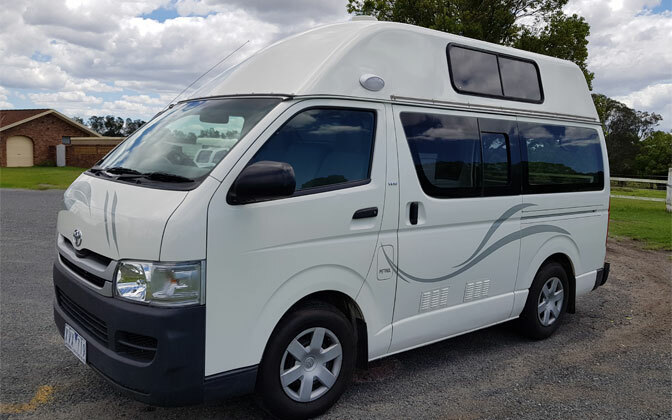 Camperman Australia has a range of great Toyota Hiace high-top campervans to suit from 1 to 5 people, allowing you the freedom to explore our great country at your own pace! With eight great locations up and down the east coast between Melbourne and Cairns to start or finish your holiday and 8 fully self contained camper models to choose from, they are sure to have the perfect solution for your family. Full cover insurance with only a $500 excess/bond. When you hire a camper with us, you’ll have a great time exploring Australia’s best city Brisbane and the rest of our beautiful country. Rent a camper from us today. We offer great value cheap campervan and motorhome hire Brisbane. Our mission is to help travelers find the best deal on motorhome and campervan rental in Brisbane. If you’re looking for the best deal on campervan hire Brisbane then look no further!